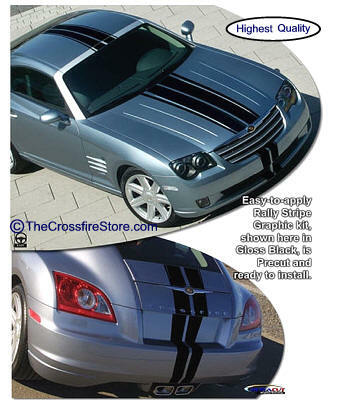 Set your '04-'08 Chrysler Crossfire apart from the rest with our Rally Stripe graphic kit. Easy-to-install kit is packaged with PRECUT pieces, ready to install, in a wide variety of colors - NO TRIMMING required! Stripe package is not just a set of straight strips in a box. Kit consists of prefitted, tapered and contoured pieces as shown. Rally stripes are set for 0.875" (22.22mm) center spacing at time of installation. This kit is specifically made for '04-'08 Chrysler Crossfire factory bumper, hood, roof and rear hatch/lid areas and will not fit any other vehicle. Includes easy-to-follow general online instructions. 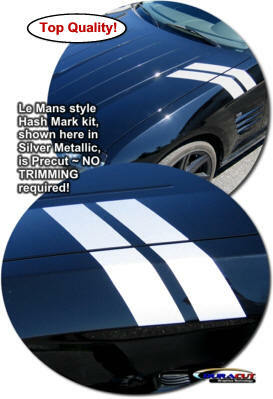 Trick out your '04-'08 Chrysler Crossfire with these simple yet aggressive "Le Mans" Style Racing Fender Hash Marks that are easily installed on the Driver side front fender - or order two (2) sets and do BOTH fenders! This Hash Mark kit is not just a set of straight strips. 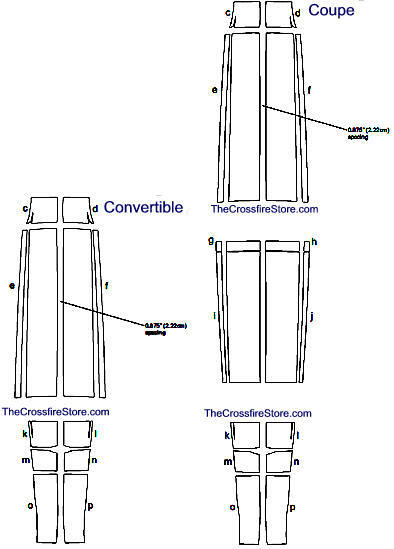 Our graphic kit consists of pre-fitted and contoured pieces that are specifically made for the '04-'08 Chrysler Crossfire factory Fender area and will not fit any other vehicle (straight stripes simply DO NOT work on the multi contoured fenders of this vehicle).